Many New Year Resolutions revolve around losing weight, eating healthy, exercising and joining a gym. For many of the regular gym goers, this is a time of fear when so many more people will be taking up their precious squat racks and treadmills. 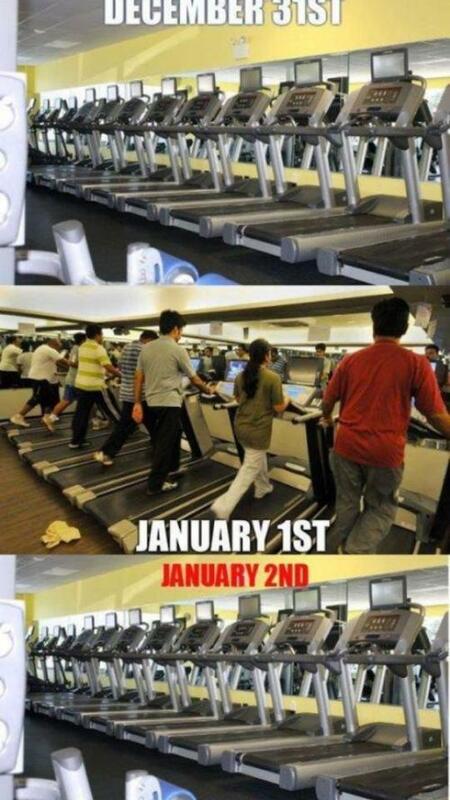 For the regular gym goers they know the rush that the New Year brings and that it won’t last very long. 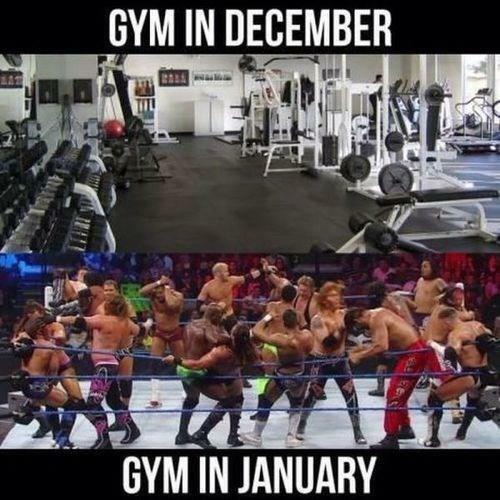 There are many jokes on the internet and around the gym that happen this time of year. 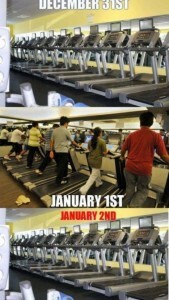 The regular gym goers joke about it all the time. My goal is to prove all those regulars wrong. 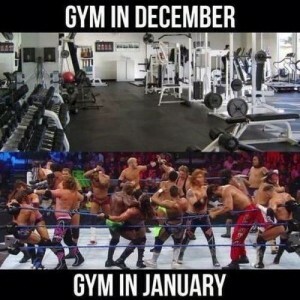 I want o help all of those New Year’s resolutioners stick with their new habits and keep the gym busy all year long. I mean obesity is a huge epidemic in our country and with a little exercise so many diseases can be prevented and the quality of life that someone has can be vastly improved with a little exercise. I give props to those that genuinely want to make that all important change and they take the first step in getting healthy. The problem arises after the excitement starts to wear off. To help prevent that resolutioner drop out you need to make a plan and start to develop the exercise habit. First write down your health and fitness goals, run it by someone to make sure they are realistic. Do some research, check out fitness clubs first to see if they have what you are looking for, including an environment that is comfortable for you to be in and is not intimidating to you. Try the club out a few times, especially around the normal time you would work out to make sure it is a fit with what you are looking for. Don’t just join the closest club to your place. It may be convenient but if it is not an environment you can see your self thriving in keep shopping. Once you have some realistic goals in mind you need to start building the exercise habit. Everything else will fall into place, can be added and or modified after the habit is established. No habit = dropout = goals not reached. Small changes over a long time will make the biggest changes of all. For exercise start slow and build up over time. If you take on the mentality of go big or go home you are more likely to fail. Look at it this way. You go big in the gym the first few days and end up really sore, so sore you skip a few exercise sessions. Soon you realize that exercise is painful and you associate exercise with pain or soreness. From infancy are taught to avoid pain so it is ingrained into our subconscious. If we start to associate pain to exercise we are going to start to avoid it. Trying to work out like Mr. Olympia or like an Ironman the first day you get into the gym isn’t going to do you any good. Any of those athletes didn’t start out training like they train now so why should you? You didn’t gain that extra weight in a day so don’t think you can take it off that quickly. I don’t want to discourage anyone from exercising but going into the venture with realistic expectations will help build the habit. If you think that you are going to lose 30 pounds in a week and you don’t , then you get discouraged and give up. And that is not what I want to happen. Just because you are not dropping a ton of weight quickly doesn’t mean that you are not getting healthy. You are improving your heart and lung function, decreasing your cholesterol and blood pressure and helping to stabilize your blood sugars. Besides all that you are toning your muscles and increasing your bone density. Exercise does so much more then you can see on the surface. The extra weight will come off, you just need to stick with the program. When it comes to your nutrition you need to get that in check as well. Don’t be fooled by fad diets. Fad diets either are very restrictive and make you drop a bunch of weight really fast (usually water weight) and when you go back to your normal eating habits you gain the weight back (and sometimes more). Or the diet is too restrictive and you can’t sustain it long enough because you are too hungry and revert back to your old eating habits. The key again, like in your exercise program, is habit and small changes. Dropping a bunch of weight quickly is not helpful if you are going to gain it all back because you revert back to old habits. Weight loss isn’t rocket science, there are no fads, gimmicks or tricks that can help. If those things worked everyone would be thin and there would not be an obesity problem in Western Society. First start with building the habit, along with small changes will build up to big changes and long lasting results. Best of luck in your New Year Resolutions! Feel free to drop me a line if you have any questions.